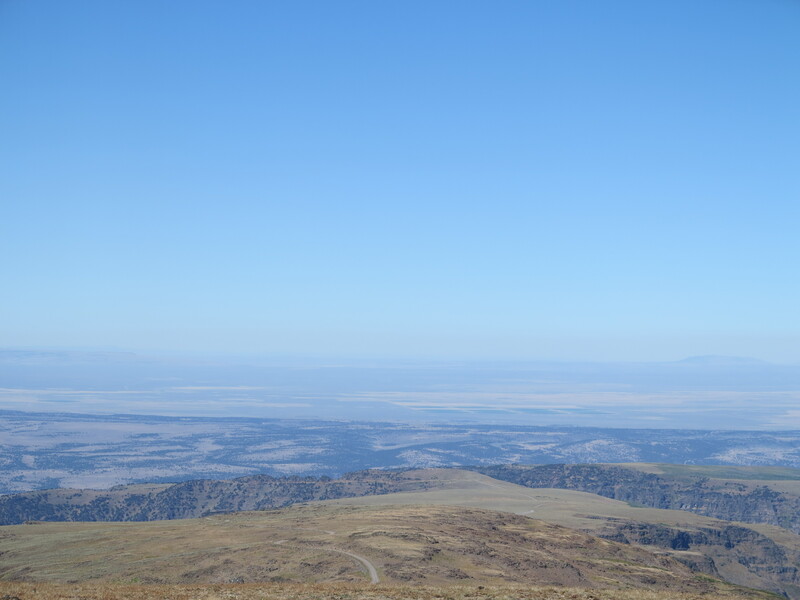 Shaped like a small mountain chain, on a 45 degree angle running northeast to southwest, the Steens Mountain is tall enough and distinct enough from other geographical features in the area. It can be viewed from many miles away. 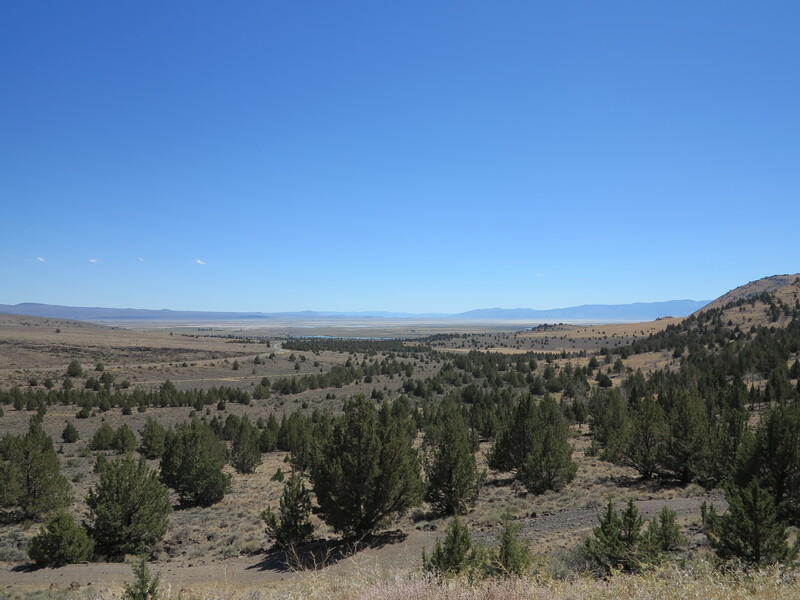 It is located in one of the less inhabited areas in the state of Oregon, at the corner with neighboring states Nevada and Idaho in the south east of the state. 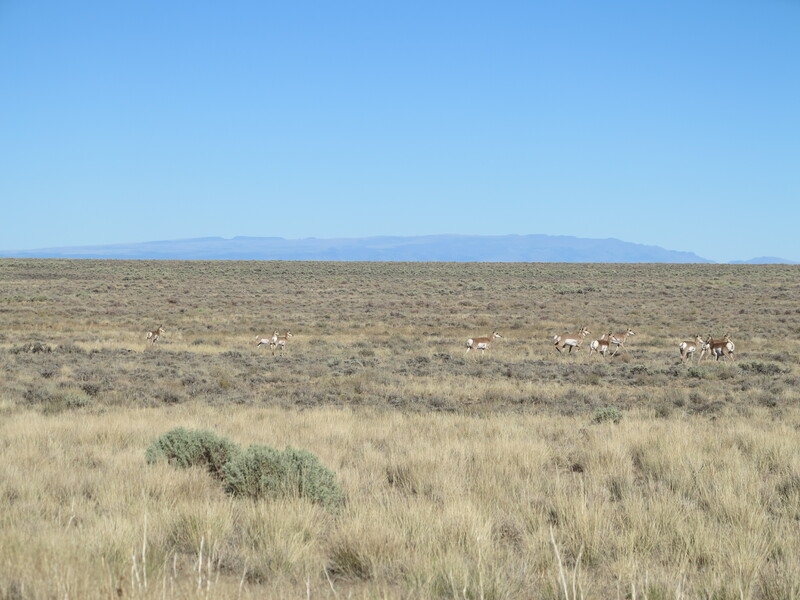 The region is a desert, sage brush is the most common vegetation. The sparse population is mostly made out of cattle ranchers and the people working on the few establishments in the area (small hotels, restaurants, general stores, gasoline – in some locations all these functions are provided by one single establishment). Hunters, tourists, bird watchers and adventure riders take turns visiting the area. 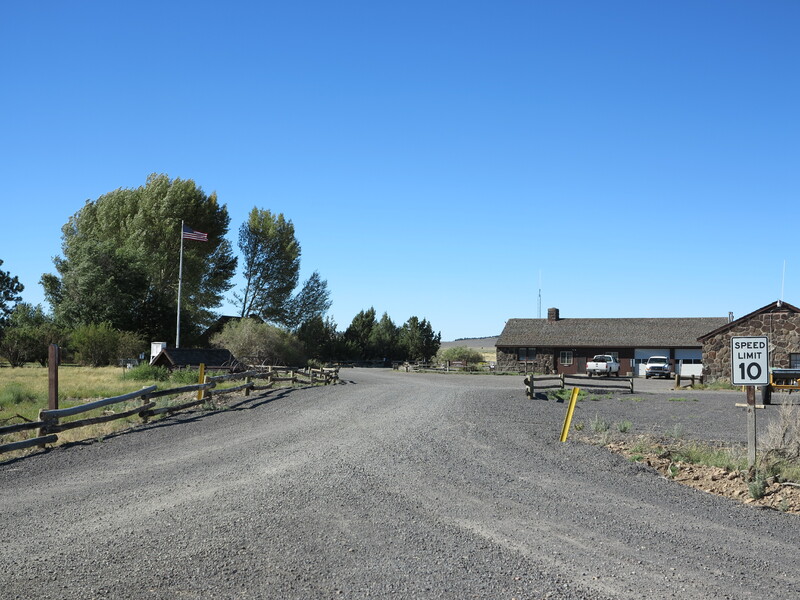 With roads allowing vehicles to go all the way to the Steens summit, the mountain is a destination in the region, and going to its summit allows you to see the region on all directions. 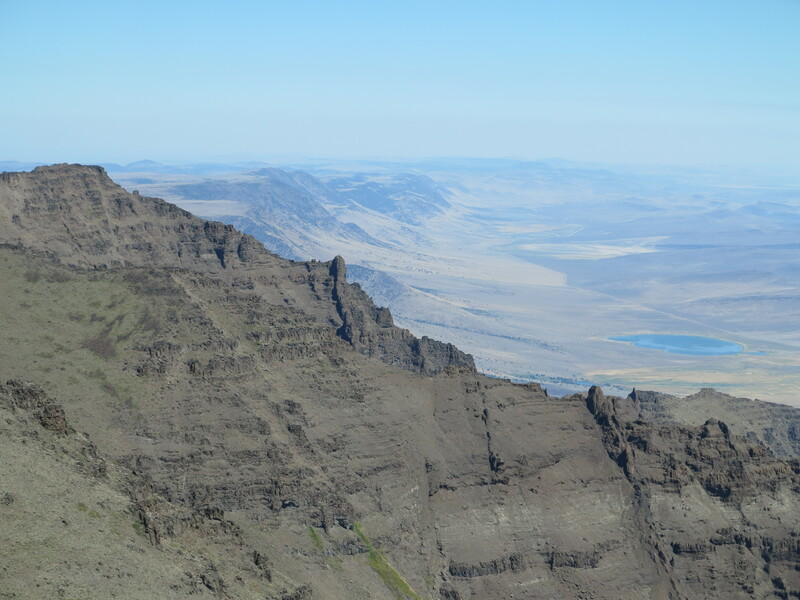 View from the Summit of the Steens Mountain, looking north, northeast – August 31st. What makes it an attraction for tourists and adventure riders? Besides the mountain itself, I can only speak of what is special to me, how that region lured me there for a third visit. Obviously there is the beauty of the region, its large scale, big sky proportions heightened by its emptiness of people. Its absence of trees, people, and bright colors… there is something about melancholy there and something that inspires adventure. And many nice roads to ride with abandon. But most importantly to me, this geography takes me to the Pampas in South America, my gaucho land. If we go from my Pampas, my home in South Brazil to the Pampas of Uruguay and far beyond towards the Argentinian Pampas and continuing to the south, now deep in Argentina, we get to Patagonia, where there is geography similar to the Steens Mountain. 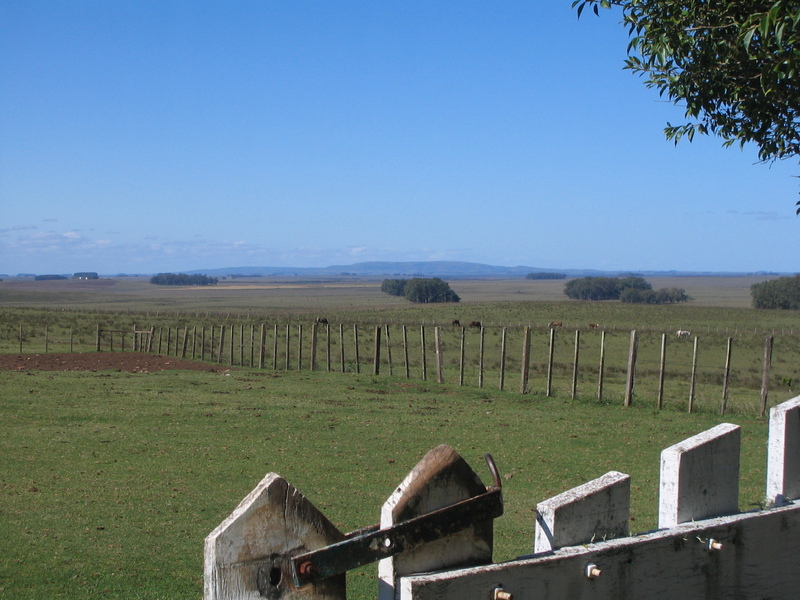 Though the pampas are greener and not mountainous, I want to think the people who live in the Pampas, Patagonia, or Steens Mountain area (and many sparsely populated areas anywhere in the world) and interact with their horses, maybe they work with cattle, share a common thread, a similar story line. These are usually barren unpopulated landscapes, places where the wind contributes to writing their life stories. In my mind this is the image of the Gaucho. I am a gaucho. Not a cowboy, although some gauchos are cowboys. 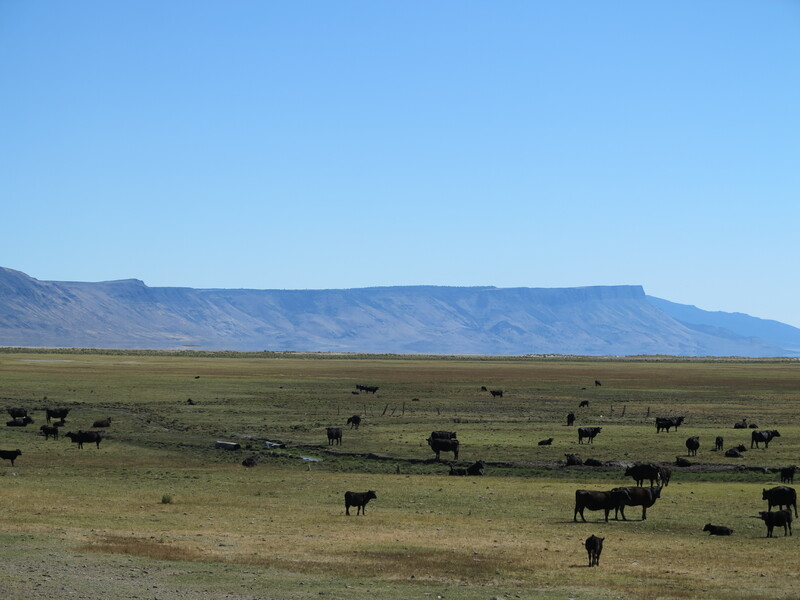 The Steens area reminds me of the Gaucho culture. Instead of trying to explain this, I should let you find it in the poetry of Argentinian Atahualpa Yupanki, have him tell this story. In many poems and songs he described the Patagonian landscape as if it were intertwined with the Gaucho peoples and their struggles. With a strong social justice flavor from the mid twentieth century, Atahualpa talks about a lonely Gaucho and his travel by horse, unveiling in his well written verses their struggles while at the same time describing the landscape of the Pampas, the Patagonia, the Andes mountains in a multitude of tones of solitude. When I meet the local people in these areas I feel respectful for their predicament, envious of their choice. There is something about living in such environments, something about introspection and a symbiotic relationship with nature. A gaucho perspective, my interpretation of a gaucho. But I also mentioned the great riding in this area, the many rarely used dirt roads traversing the area. 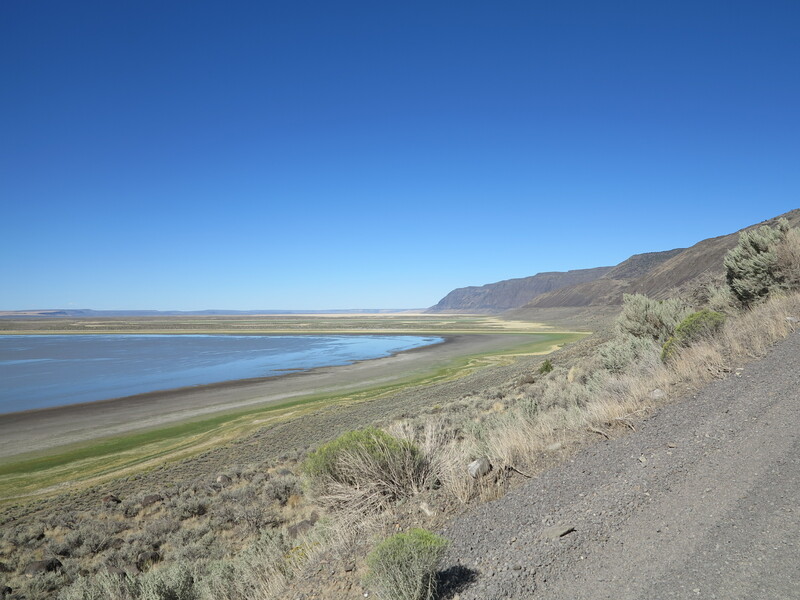 They take you to the top of the Steens Mountain or to beautiful valleys or playas, these roads are perfect for riding with abandon, without worries about traffic or fauna inadvertently crossing the road. 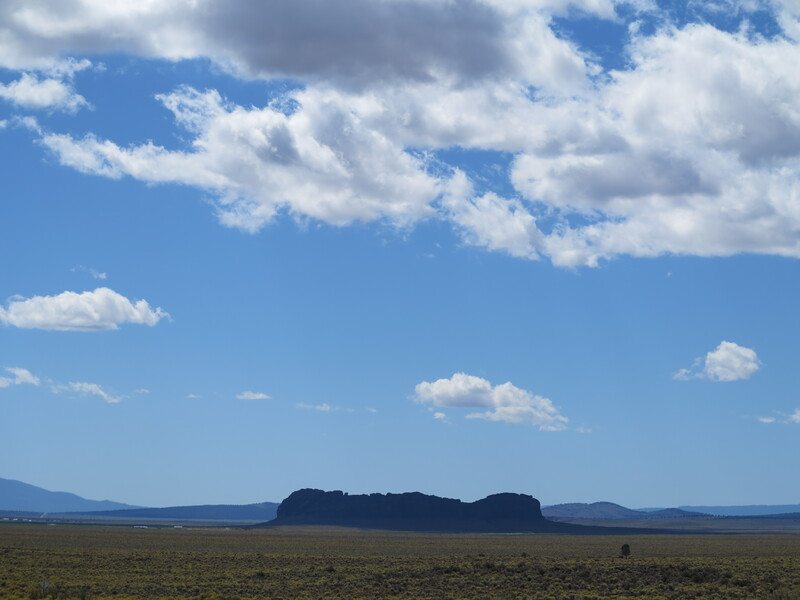 Because there are no trees to obscure your long view of the road, on most of them you can see miles ahead, as the roads snake through open valleys or flat desert floor to either disappear on the next valley, mountain, or simply in the horizon far away. You can ride fast and get in the moment. The problem is that it is so beautiful, I have to snap out of the moment, pause the full concentration riding mode to stop and take a picture every now and then. I’ve been there in 2006 and in 2010. Needless to say, I’m always thinking about riding there, ready to get back to that area on my motorcycle. I’ve claimed that area and its many roads as my favorite riding area in the world. I can be riding there or towards that area, thinking I’m riding the Ruta 40 in the Argentinian Patagonia. Or I could imagine it would be similar to traversing Mongolia, I place I have yet to visit, but I’ve seen its many two-track pathways on photos and videos posted by other riders. 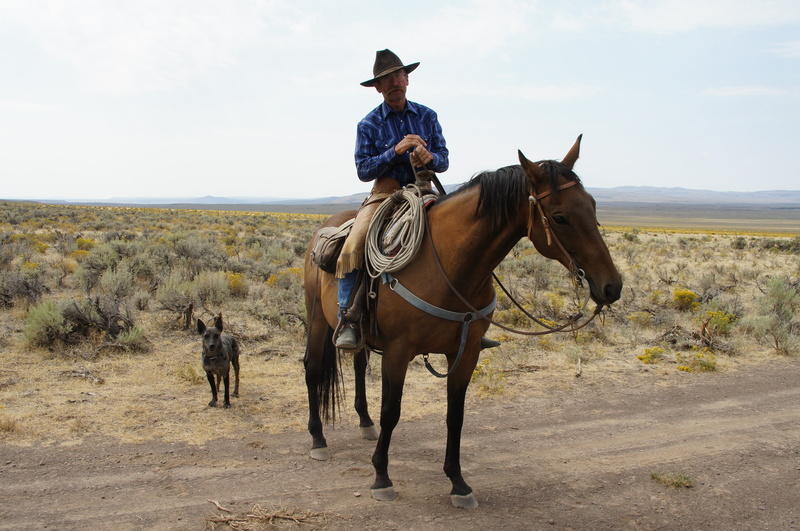 My good friend Doug also likes to ride in the Steens area. And because motorcycles are often included in our conversations, it is not difficult for the Steens to be brought up every now and then in our conversations around a drink or three at Meiji’s, our favorite hangout in Eugene. 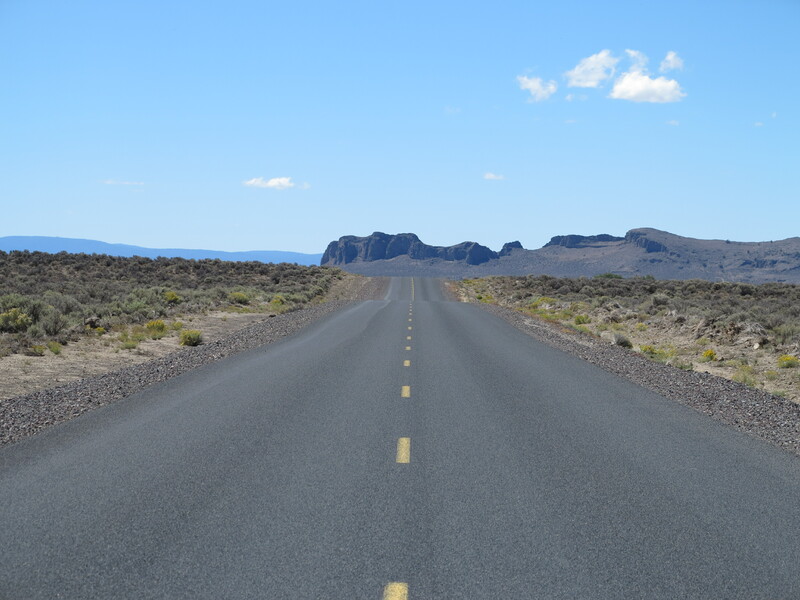 Arranging a trip to the Steens has been a question of finding an open window in our calendars early or late summer, to avoid the heat of July and August. 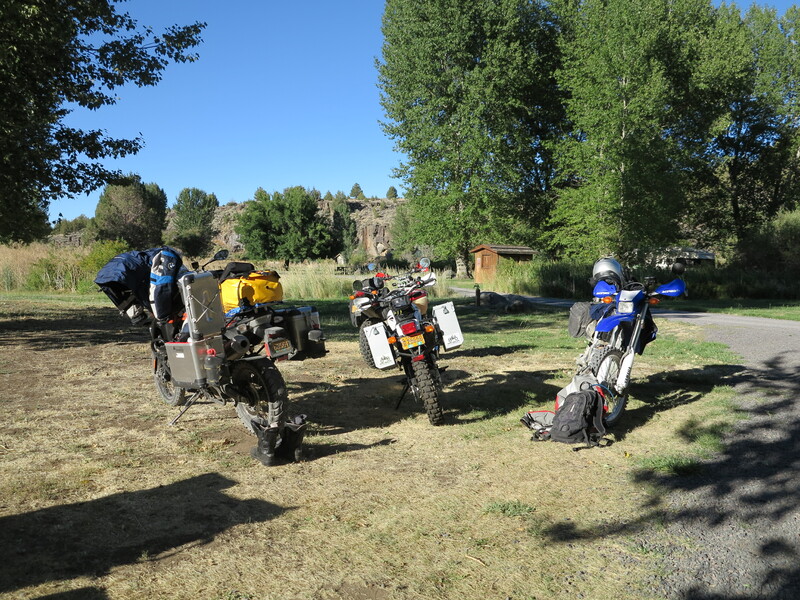 We started talking about going back to the Steens this year, the conversation went back and forth. We got several others in our riding group interested in joining us, but at some point it was down to Doug, Annie and I. And then Christian, a rider from Switzerland whom I met last year, was going to be riding in the United States at about the same time. I invited him and he promptly accepted the invitation. 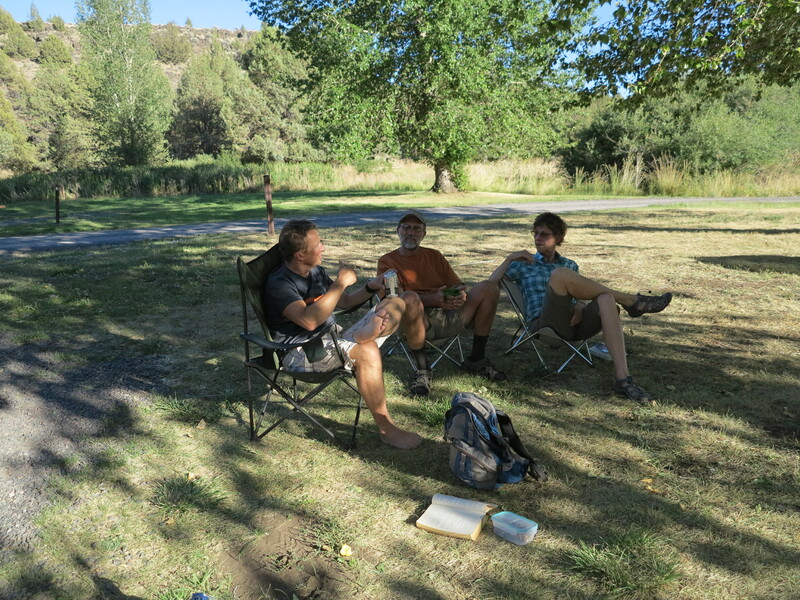 Eventually our friend Kyle, who was in the Steens with us the last time decided to join us for a day as well, bringing with him a friend of his. We now have six people on our troupe. The plan was simple: meet at the Page Springs Campground at 5pm on Friday of the labor day weekend. Doug and Annie would be driving their truck, carrying their bikes and supplies, I would be riding my bike from Eugene. 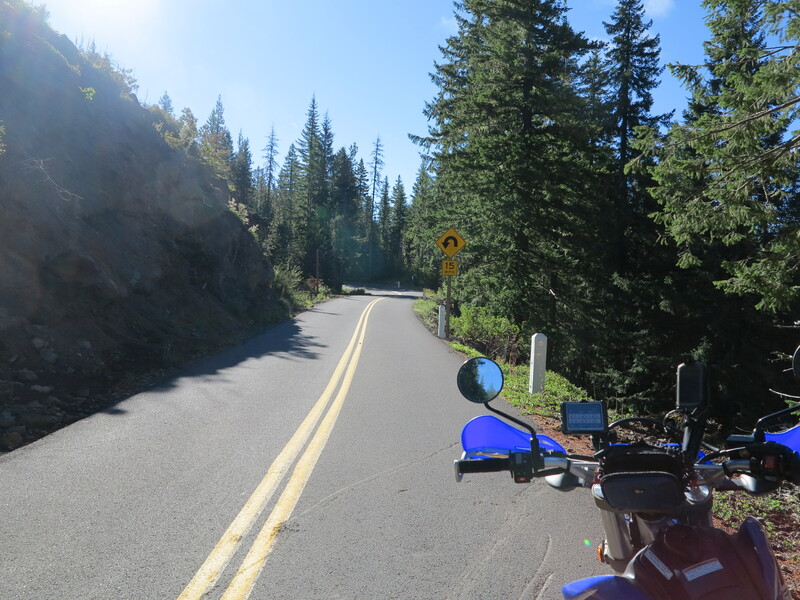 Christian was on a ride, on his brother’s F800GS, traveling the Washington coast and other areas of Washington and northern Oregon. I gave him the coordinates, he would be there Friday at 5pm. Kyle did not give us a specific day or time for when he was going to get there, but he was going to be there at some point. So, what bike to take? Doug and I ride a very similar pace when we are off pavement. Part of the riding fun is to chase each other on those fun dirt roads. But we need to be in compatible motorcycles otherwise it doesn’t work. If he brings his KTM Adventure 950, I would bring the Triumph Tiger 800XC. 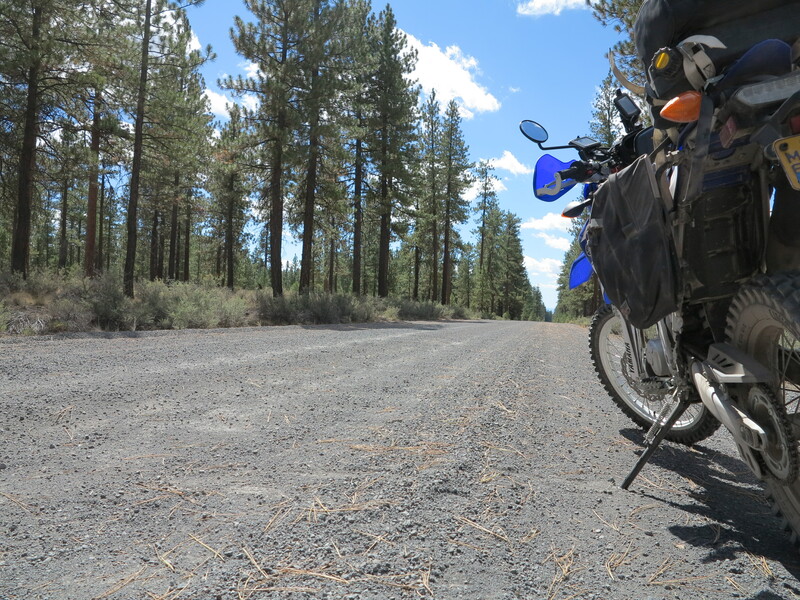 But we wanted to explore some of the smaller side roads, with lots of rocks, ruts, and sand, which are a lot more fun on the small bikes. So we decided for the small bikes, Doug would bring his Husqvarna TE610. I would bring my Yamaha WR250R. I realize an entire season was almost over and I had only taken this bike out for a couple of times. 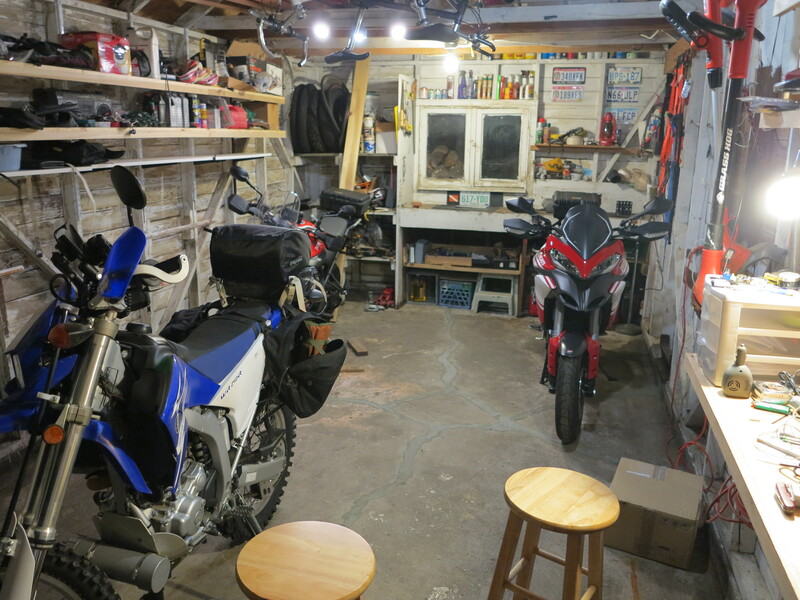 One of these times was a five mile ride to test the new tires I had installed last spring and the other time, some 10 miles or so, was to get the fluids warmed up, do an oil change and air filter maintenance, and fill up the tank. I point my finger squarely at Ducati, I blame it for situation. Like the Streetfighter before the Multistrada, they are the only bikes I want to ride. But the Yamaha can be a lot of fun, as confirmed by this trip. It just needs the appropriate context to deliver its fun factor. 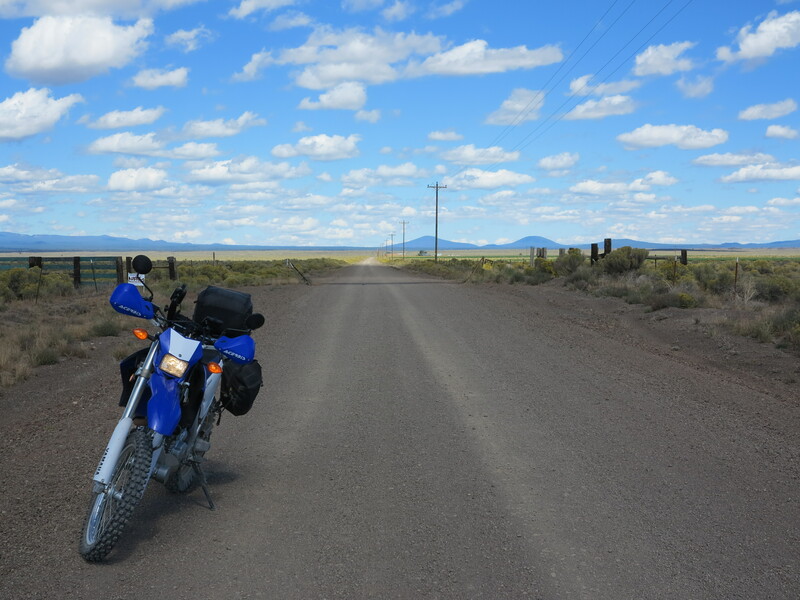 The Steens is one such area where this bike shines. I filled a large plastic latch box with my camping gear and other supplies and dropped it off with Doug and Annie to go in their truck. The tools, spare tubes, rain gear, a change of clothes, some food, water and one extra gallon of fuel would go with me. 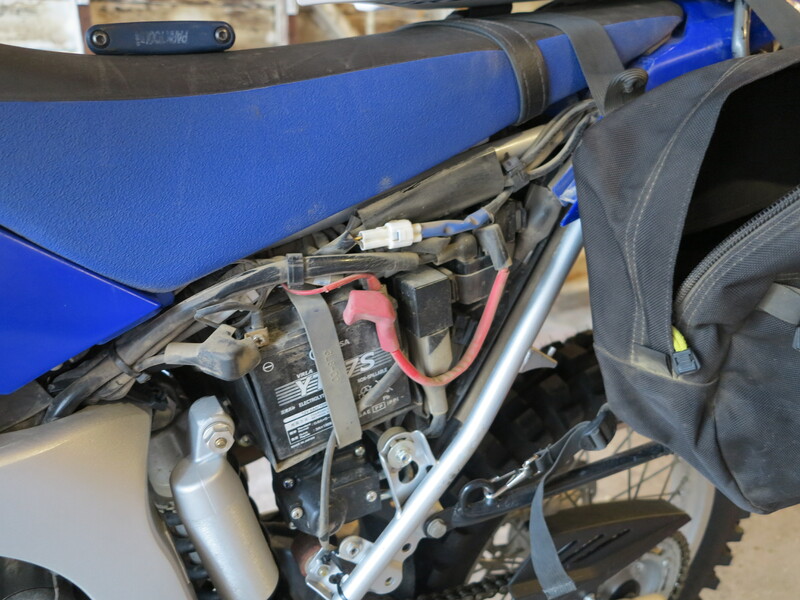 This bike has a very small 2.2 gallon tank, the reserve fuel amber light comes on at about 90 miles of riding, and at that time you probably have another 20 miles before you run out of fuel. Extra fuel is a necessity, although I never had to use it on this entire trip. Thursday evening I had the bike packed and ready to go. Ready to go, navigation tools, camera bag for the G1X. I woke up Friday morning to gray skies and a few drops of rain, actually it was more like a coast mist, but enough to accumulate drops of water in the visor when riding. 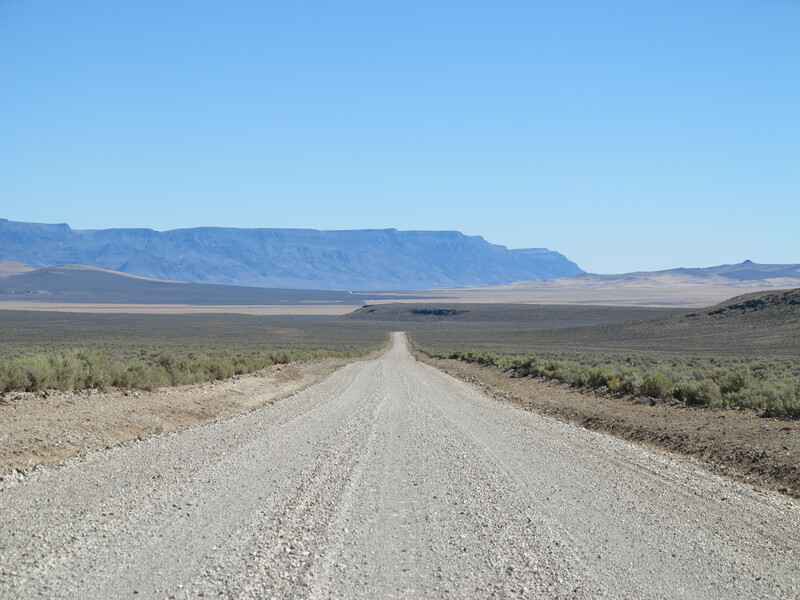 I knew it was supposed to rain at some point, even in the Steens area, but the forecast for rain was for a few days down the road only (and we encountered it). Despite the gray skies and the mist, I trusted the forecast, kept my rain gear in the bag and wished for the sun to appear soon. I started my trip at about 7am. The plan was to take 105 to 126 to 242 (fuel up in Sisters) to 20 to 97 to China Hat for some gravel (fuel up in Christmas Valley) and then 31 (fuel up in Paisley) and from there I would make a decision about fuel, go to Plush for a last tank of fuel or not, depending on how the bike was consuming fuel, and from there there it would mostly be dirt and gravel roads on the desert all the way to the Page Springs campground. For the first hour of this ride there was no sun, it was a bit chilly. It was only higher up in the McEnzie pass when I saw the sun for the first time. Meanwhile I was just getting used to the bike and getting on the travel mode. The new tires’ tall and spaced out knobs were flexing, making for an interesting riding experience. It was as if the bike floated on the road when going straight. But on curves the rear tire gave the sensation it was almost flat. I had set the air pressure at the upper band of the manufacturer’s recommended pressure for these tires, and I had to stop and re-confirm the air pressure was still there. A couple of views of the Sisters mountains with a date stamp. Who knows what this will look like in terms of snow coverage, in the end of August, let’s say 20 years from now. 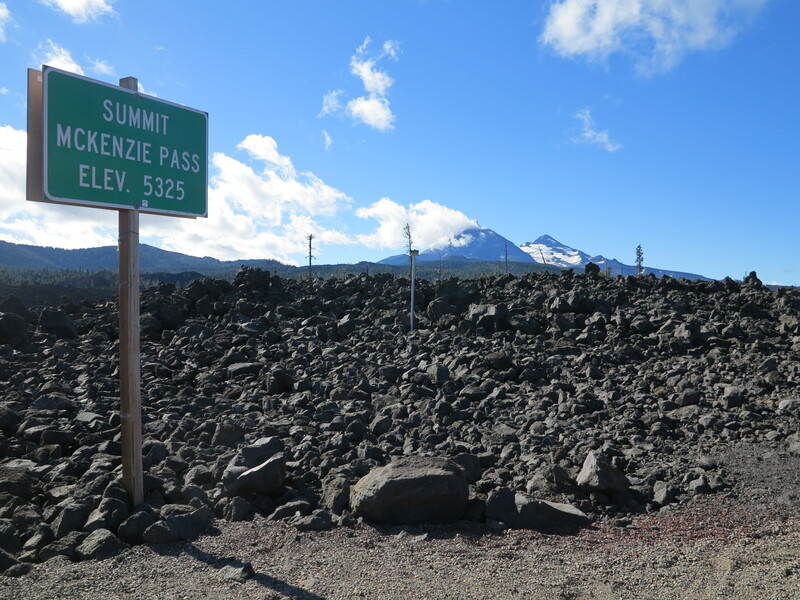 Soon I went through the McEnzie pass summit. The fuel amber light had turned on during the McEnzie climb, at 76 miles since I had filled the tank the last time. It made me worried, is there something going wrong with this bike’s gas consumption? It came on 10-15 miles earlier than expected. I got easy on the throttle. And I took in consideration I was on a steep climb, I had let the engine run on idle several times in my process of doing oil change, filter maintenance, chain cleaning a couple of months ago, and it was old gasoline by now. When I filled the tank in Sisters, I had traveled 95 miles from home, 103 miles since the last time I had filled the tank and the bike had taken 1.85 gallons, making approximately 56 mpg. 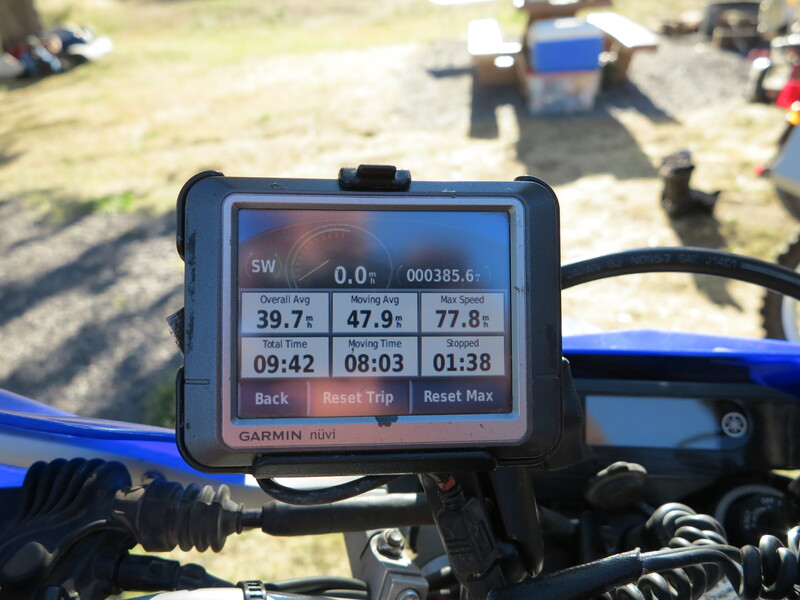 Not too bad, easing the throttle on the way down the other side of the pass probably helped. 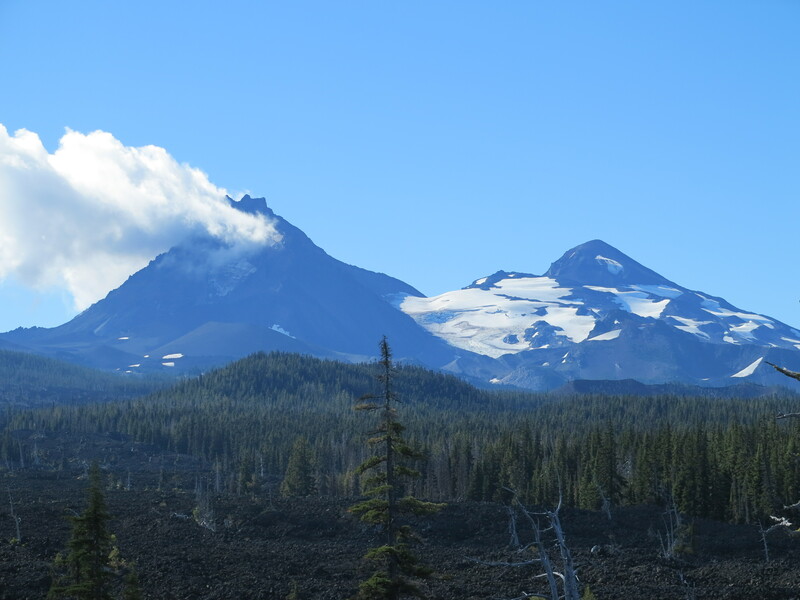 From Sisters I traveled to Bend and from there a short burst on 97 south towards the China Hat road for some gravel. Although the picture below doesn’t show it well, the China Hat road was a washboard. I don’t remember it being that way in the past. My new tires, that were giving me the cushion ride on pavement now made me feel I was riding a jackhammer. As the Magliozzi brothers of the Car Talk show mentioned on the shows aired these last two weekends, going fast (55-60 mph, they said) is the best way to take care of the problem. But it doesn’t solve it completely. I’m pretty sure too much air in the tires was a major contributing factor. The road got better once we cleared the tree area and the road gravel changed from gray to red. I’m not sure that was the reason, but it was better from this point forward. People are always surprised when I tell I ride this little bike on long distances. Well, if I had to ride paved roads all the time, this bike would be a problem. But when I ride it on gravel, it just seems it can go forever, miles go by and the time dimension loses importance. Yes, I would like for it to have more power. But it is good enough, it will reward me later. Soon I was in the Fort Rock area. From there I took some flat roads towards Christmas Valley. The cold of the morning had disappeared completely, it was now warm and sunny. Close to Christmas Valley. Beautiful clouds. 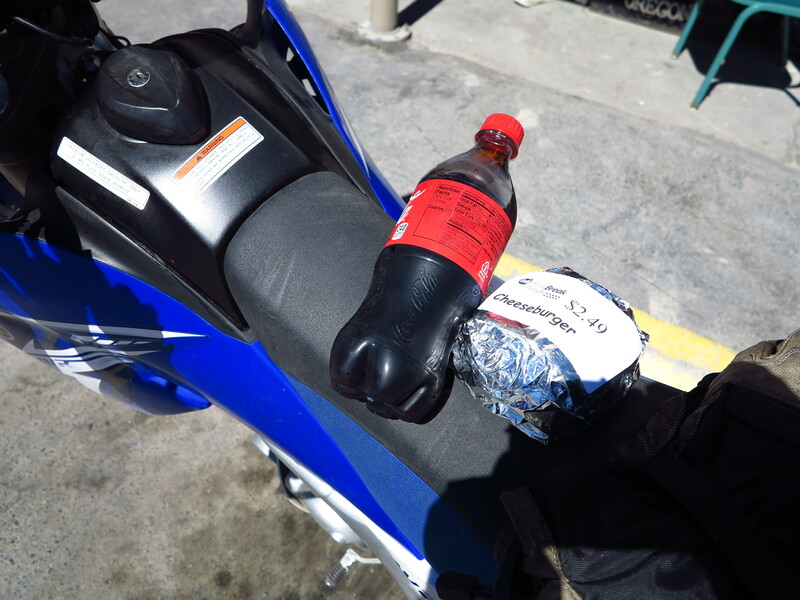 I stopped for fuel and lunch in Christmas Valley. 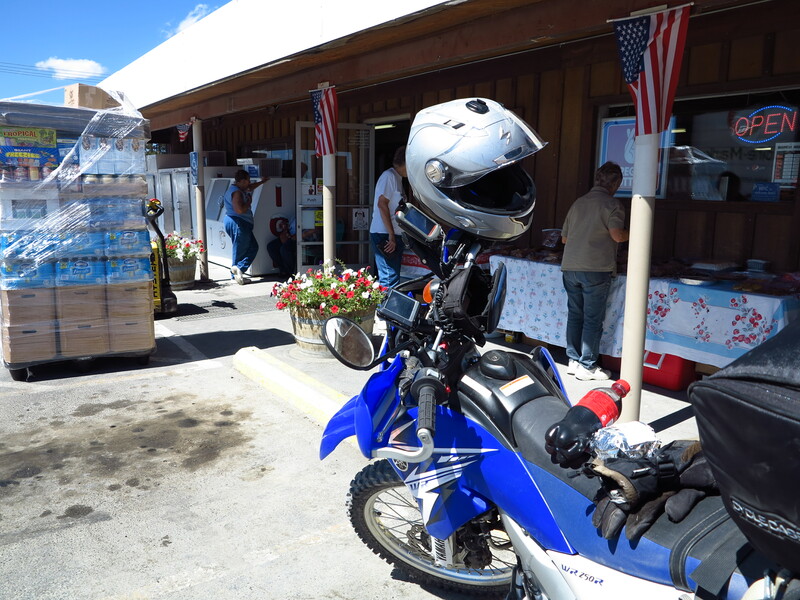 The bike had now traveled 206.2 miles from home, 111.7 miles since last refuel in Sisters, and it took 1.8 gallons, making for an average consumption of 62mpg. That’s more like it. I had a great lunch. Well, it tasted good. There hasn’t been a time when I stopped in this gas station and market in Christmas Valley and didn’t see a lot of exchange taking place. Delivery trucks, customers of all sorts getting gasoline and other supplies. This is the center of commerce in this region, a prosperous business. To prove my point, they are expanding the building, the construction foundation was going in, soon this will be a larger market or restaurant, maybe a hotel as well? From Christmas Valley I took Hwy 31 towards Paisley. 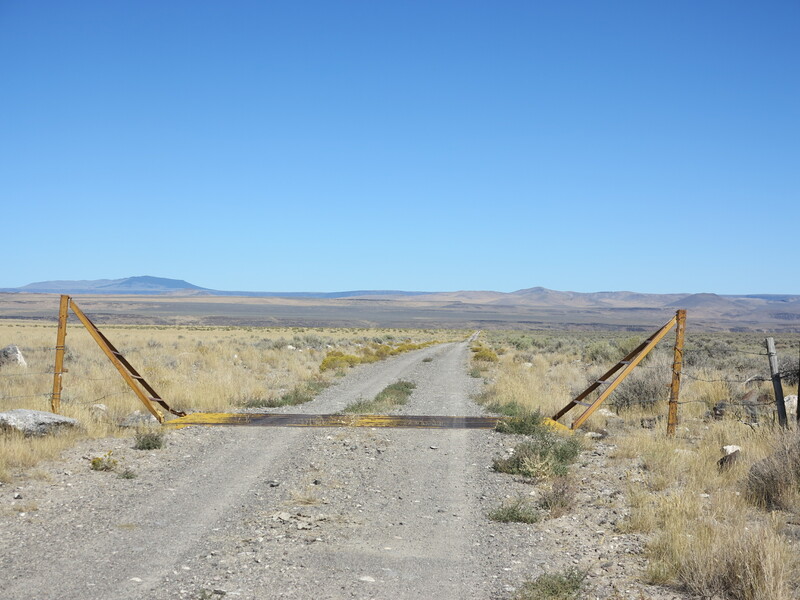 The last two times I went to the Steens Mountain, at this point in Christmas Valley I had taken Fandango rd. But I wanted to stay away from that very remote area, although I would eventually take some remote roads this time as well. But not as remote as the Fandango and Sheep Rock roads can be. Paisley was just 56 miles down the road from Christmas Valley. I filled the tank again with non-ethanol gasoline. Now I had to make a choice, which roads to take to get to the Page Springs campground. The most direct route is a dirt road only, with no more gas stations all the way to Page Springs 120 miles away. Or I could stop in Plush, adding some 20-30 miles to my itinerary but have a full tank of gas and be on the safe side. I decided to go the most direct route. 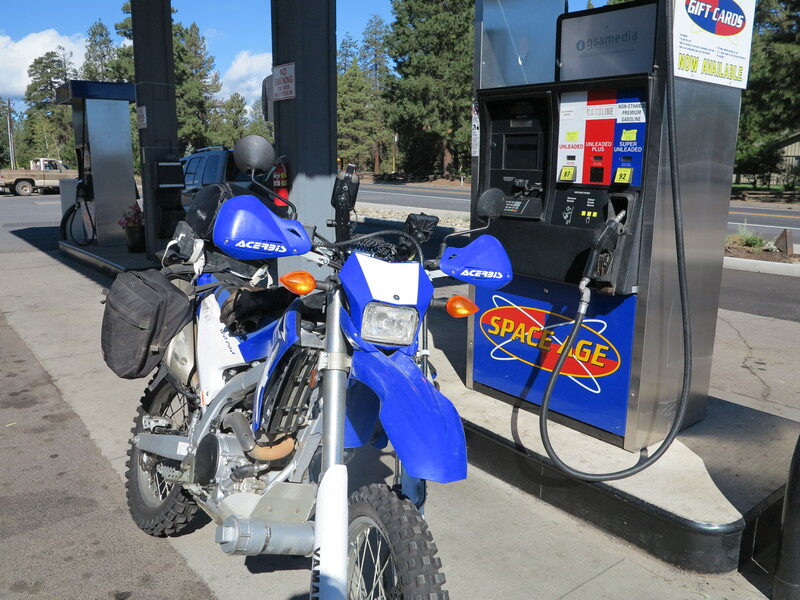 With the bike’s 2.2 gallons and the extra one-gallon I could travel 180-200 miles. Good enough, let’s go! 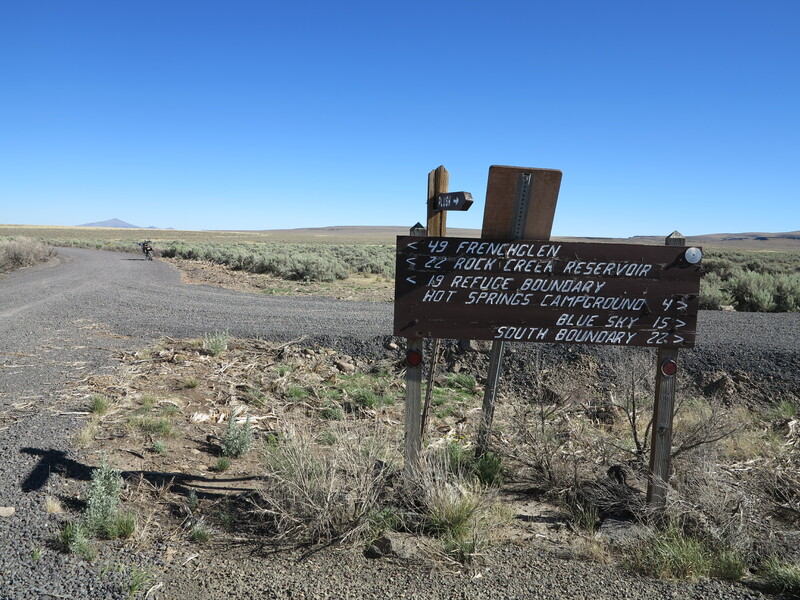 From now on, I would only see pavement for a little while when crossing 395, and later 205, close to Frenchglen, just a few miles before arriving in the Page Springs campground. I was now about to enter the deserted areas, the much anticipated Gaucho zone. And when on these roads, I feel like the Gaucho described by Atahualpa Yupanki, my motorcycle is my horse, riding alone with my thoughts and the motorcycle and its noises as my company. If when we die we reach serenity, I swear, life, I’m going to miss you. Here we go sir, I come from the other side of the mountains where the sun sets. 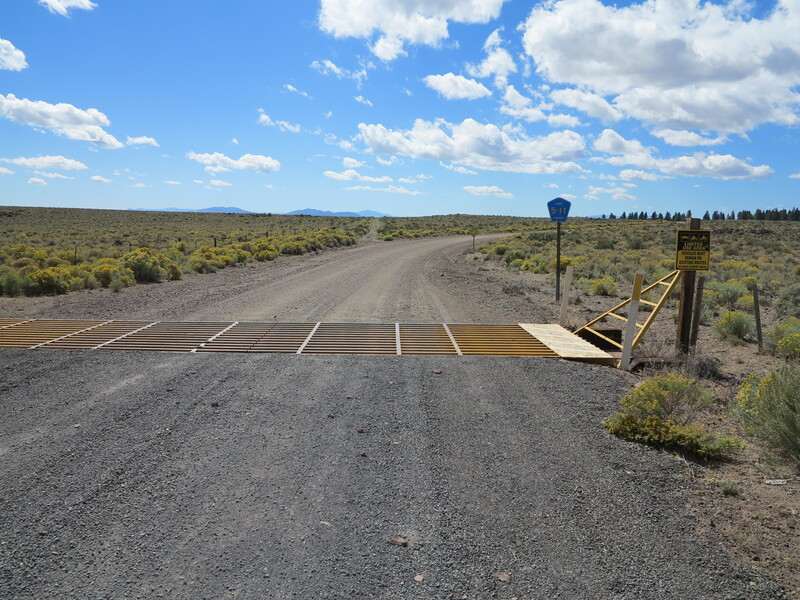 Eventually the road connected to the XL Ranch road, as I got closer to Abert Lake and eventually 395. 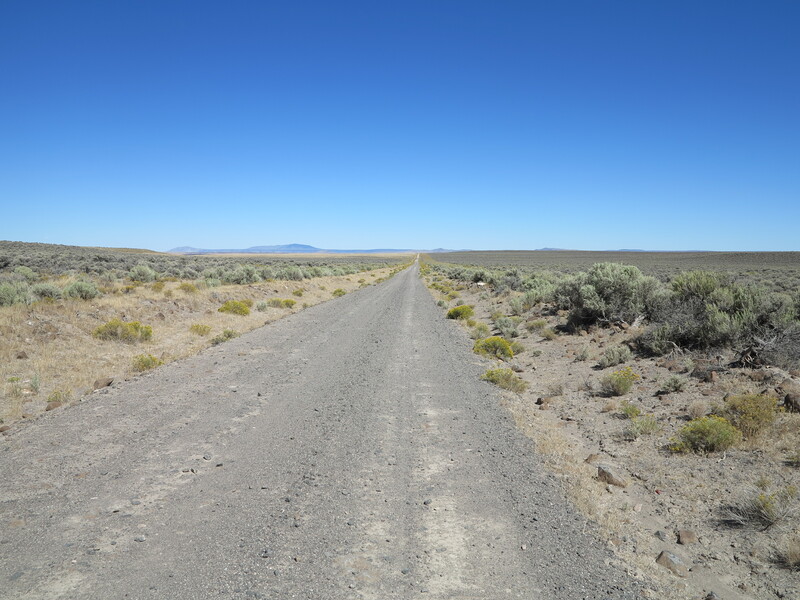 On the other side of 395 I got to the Hogback road, a gravel highway. 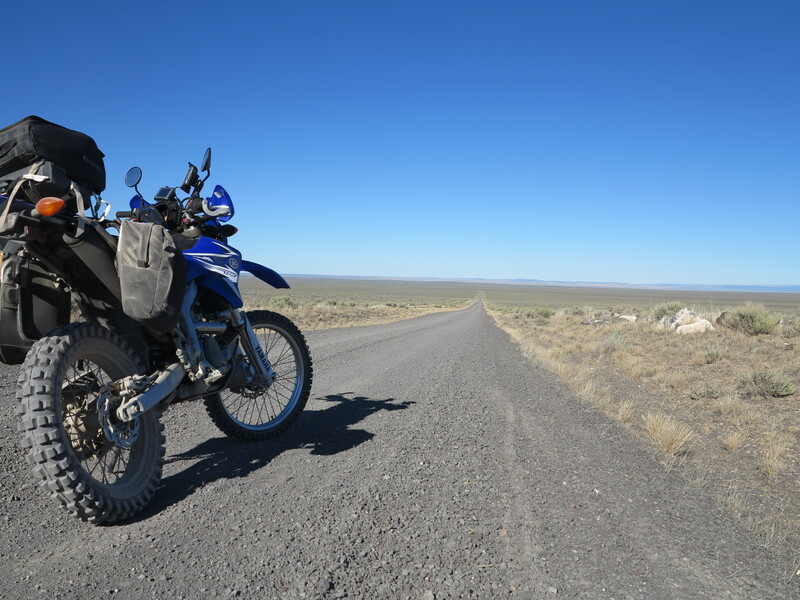 It is often windy here, and this road probably resembles some parts of Patagonia’s Ruta 40. The parts of it that are still unpaved, that is. And from here I climbed Hart Mountain. 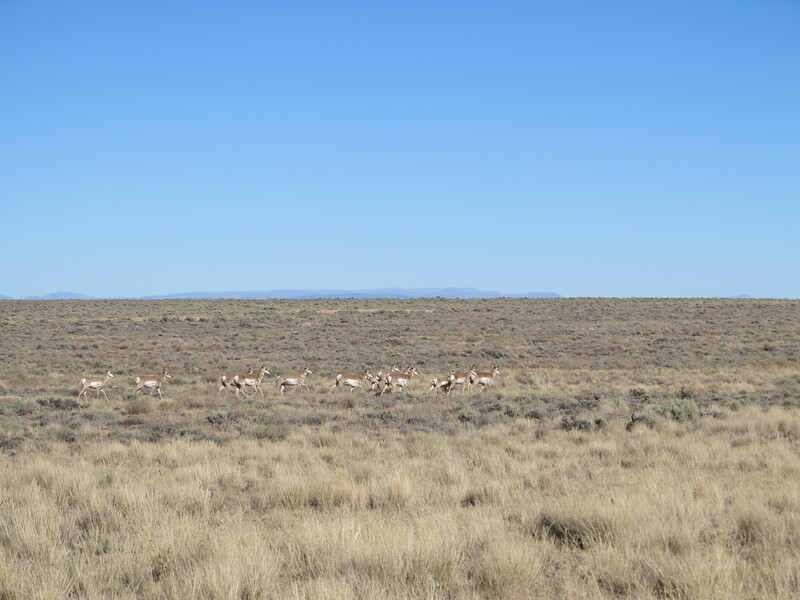 I went past the Antelope Refuge. I was on the final stretch, 49 miles to Frenchglen, and Page Springs would be another 3 miles from there. I was feathering the throttle, traveling at 65-70 mph, making sure I had the fuel consumption in check. Although I had the extra gallon, I was not interested in stopping and re-fueling. 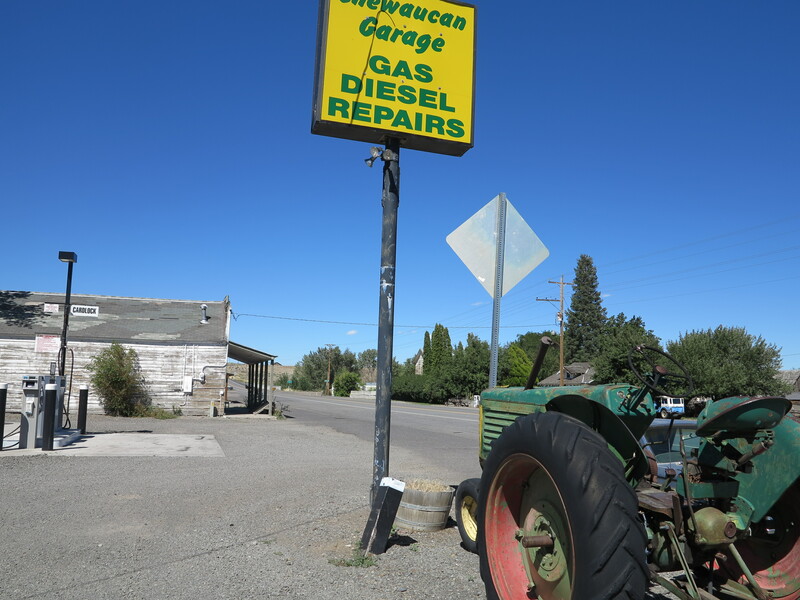 In 2010, the last time I came this way, and having come from Christmas Valley via Fandango road, by this time I had already added to the bike’s tank 1.5 gallons of gasoline (the extra gallon and the two quarter gallon MSR cans). Still going, mostly downhill, right? The amber light came on at more than a 100 miles from the last re-fuel. A record! And I was less than 20 miles from my destination, that meant I would make it there without the use of the extra gallon. I made it to 205, a few miles of pavement going north towards Frenchglen. And soon I was there. 385.6 miles, some 620 Km. The bike had traveled 123.3 miles, the furthest I’ve ridden with one tank of gas. Overall it was a nice trip there, a great opportunity to ride on my own, living it as the Gaucho I am, enjoying my motorcycle, my horse. When I got there, at just about 5pm, Christian had just arrived a few minutes earlier. If you look closely, there are four bikes there. Christian had never met Doug and Annie before this day, they got along very well. When I got there they were seating under the shade of a tree, talking away like old friends. 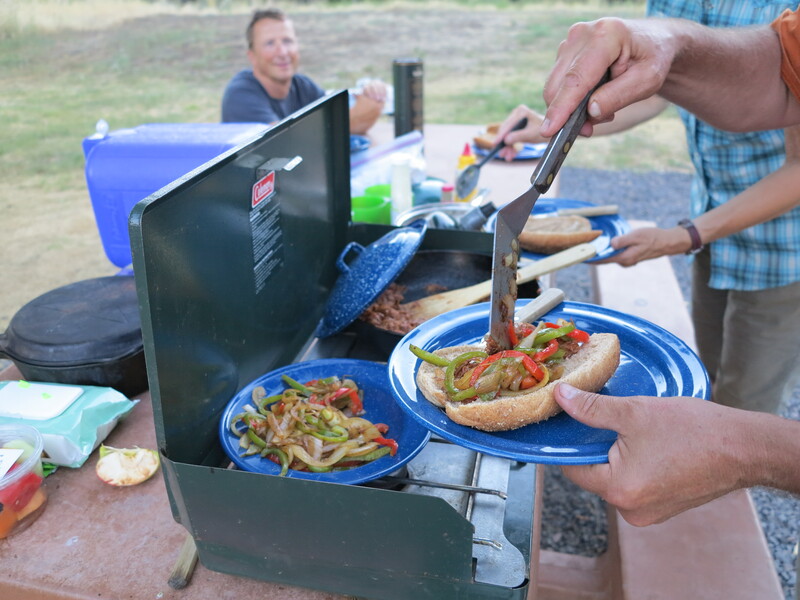 In the past, before our friend Alain moved to Australia, our riding trips were well organized by him, we had common meals set up. But we were planning this on our own, no one was really organizing it properly. There wasn’t a proper plan. All we had was a destination, but the dates kept changing, at some point we were unsure who was really going to be there, food would be every one bringing their own. But in the last hour Annie came to the rescue. She planned all meals, bought all the supplies, including dry ice and regular ice to keep things well preserved and the beer cold. It was perfect, and every evening we had a great meal and every morning a great breakfast. Much better than I ever imagined possible. Thank you Annie! 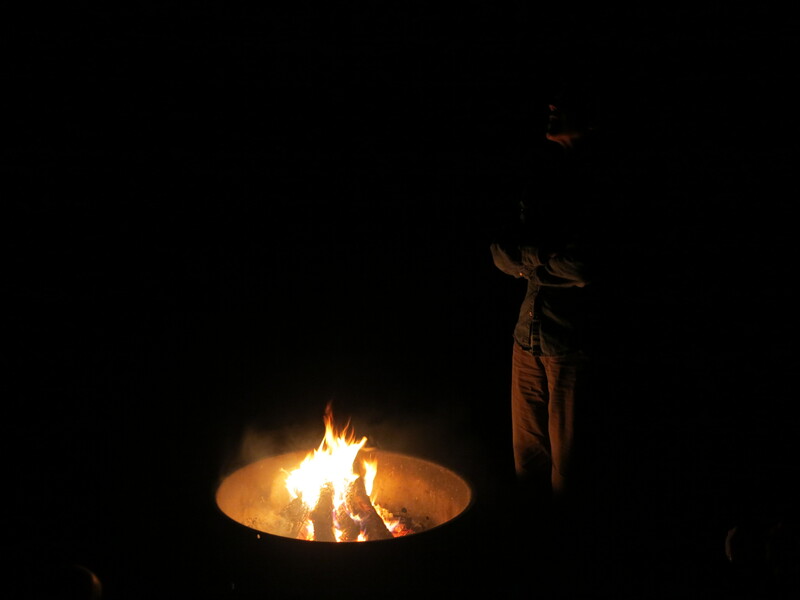 And later that evening we got the fire going. And a shot of single malt whiskey. Great conversations. Perfect end for a perfect day, where I traveled to my beloved Pampas, navigated through my Gaucho soul, and arrived at the camp which was warm from the fire and by great friends. Christian is great company, a great match for Doug and Annie and me. This group had a great time going places together for a few days. 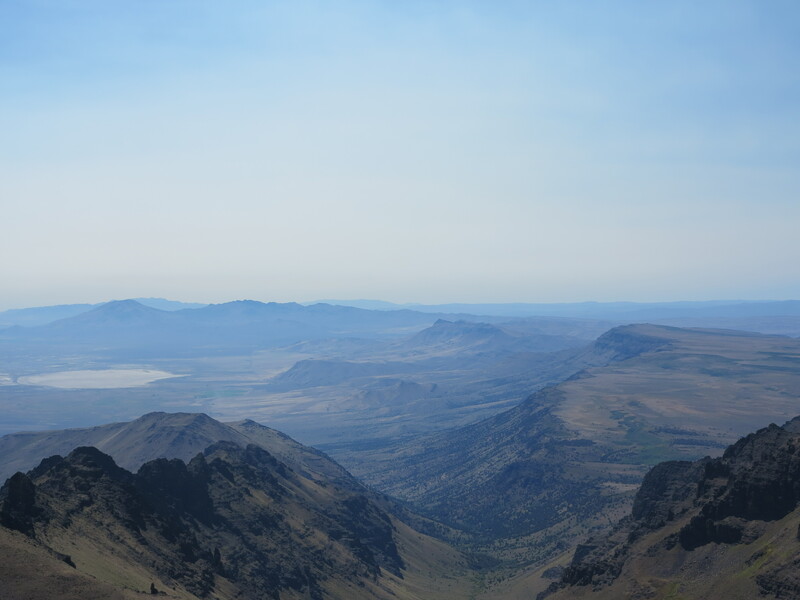 In the next post I will describe our adventures doing the Steens Mountain loop, including a trip all the way to the summit. Following that story I will document my favorite riding loop in this favorite riding area of mine. And the final post will be our return to Eugene. Great times, great photos and a couple of nice videos! 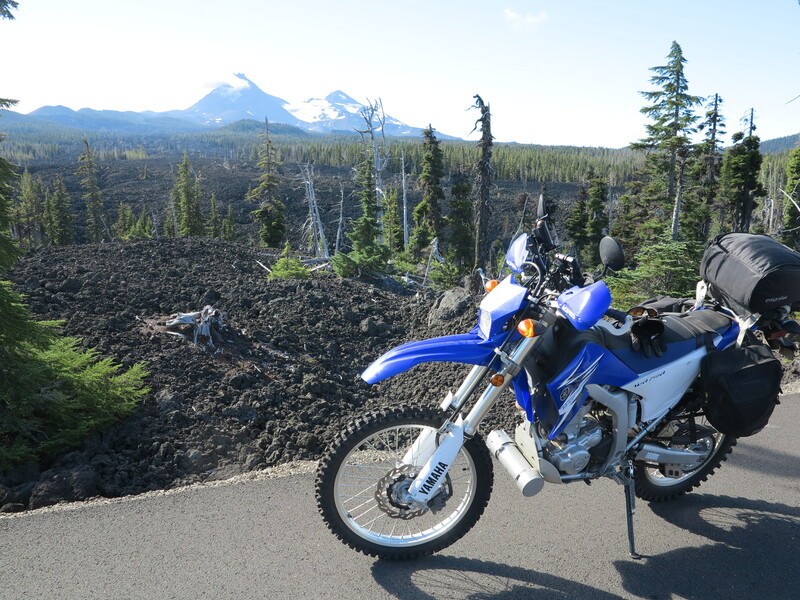 This entry was posted in Riding the Yamaha, The Book and tagged Atahualpa Yupanki, gaucho, Steens Mountain, WR250R. Bookmark the permalink. Fantastic photo’s mate and an even better story. Nothing like motorcycles to bring a bunch of strangers together and make them feel like long lost friends. Can’t wait for part 2. Thank you! It gets better on part 2, nice vistas. But my favorite riding area is going to be on part 3, excellent vistas, best dirt roads ever, and a few awesome videos of the WR250R in action on those roads. I’ve never been to the Steens but have heard so many great stories we’ll have to get there some day. So dry and desolate….. looking forward to part 2. 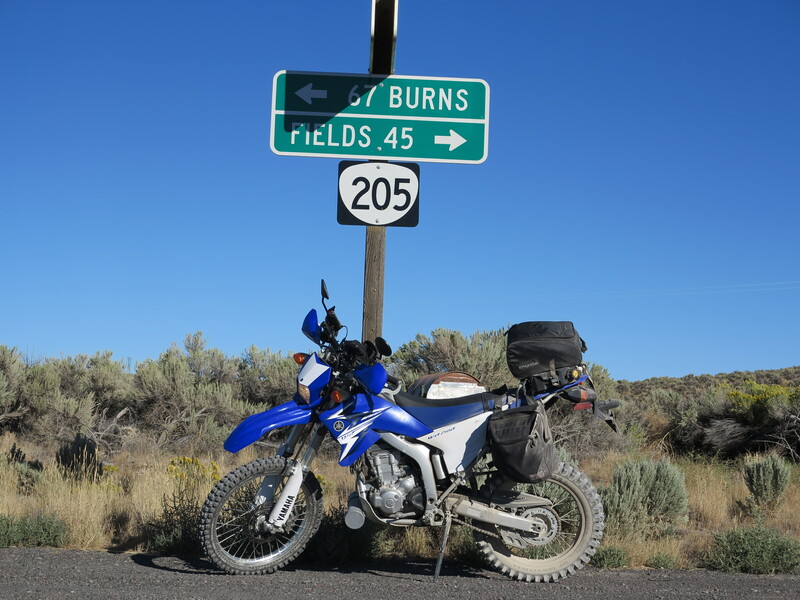 Do you have a section on the WR250 equipment, mods, luggage, accessories? I don’t think I do. But it is a very straight forward motorcycle. No changes to motor or exhaust. Skid plate is Ricochet. Handguards are the largest Acerbis I could find. I have two 12 V power sources directly connected from the battery with appropriate fuse. 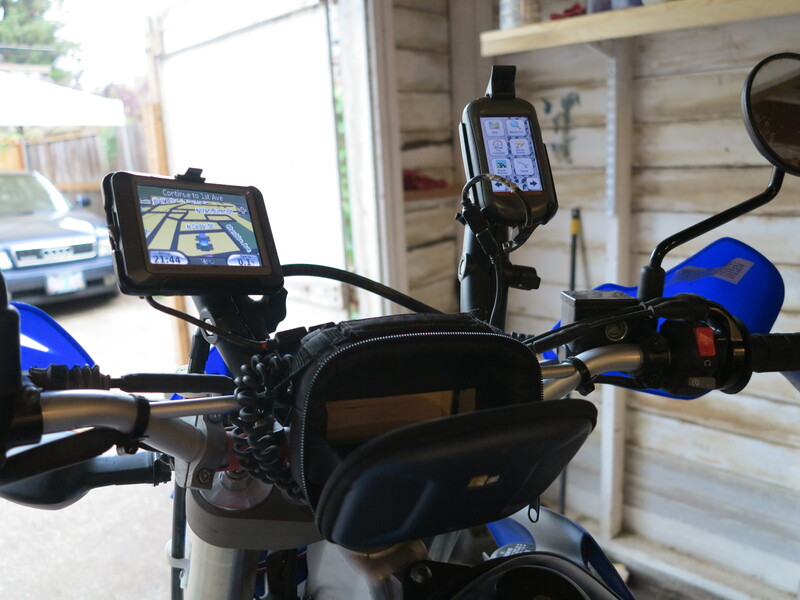 One is at the handlebars, the other one connects with the rear of the bike, just hangs there for battery tender or goes inside my dirt bagz, depending on need. Dirt bagz installed, eliminated passenger pegs to accommodate the racks for the bags. Rear rack is Yamaha accessory. And I believe that’s it. I wish it had 10 extra HP. Nothing else needed. Only maintenance is frequent oil changes with regular Yamalube, air filter cleaning, and I’m on the third set of rear tires, second front tire, at 7,000 miles.